MP3 itself officially became royalty free with the expiration of its remaining patents. That doesn’t mean that we have reached the end of audio codec development though. 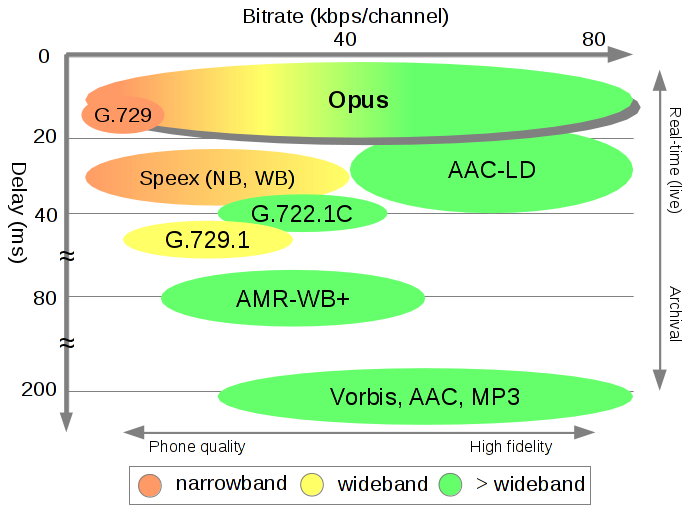 We still can benefit from further codec improvements, especially in low latency and low bandwidth situations, and that is where Opus comes in. which is a major advancement for low-bitrate and low latency scenarios such as real-time audio over cellular connections. What often gets missed however with all the talk of how great Opus is for low bitrates, is its fantastic performance at higher bitrates. 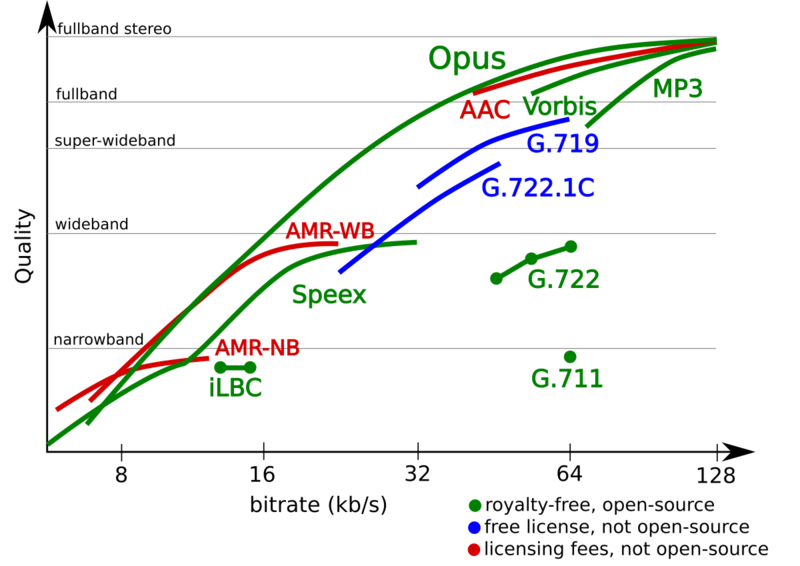 Opus reaches the point where further bitrate increases no longer result in perceptible audio quality improvements around 192 kbps, which is much lower than the ~256 kbps that MP3 needs to accomplish the same effect, and Opus continues to outperform MP3 throughout the entire range of bitrates. This is of course not a replacement for archival formats that provide lossless compression such as FLAC (which is also royalty free and FOSS, just like Opus and MP3), but is great for everyday usage for regular music listening. Opus is truly a fantastic piece of software engineering, and is clearly one of the best audio codecs made to date, all while being royalty free. So why isn’t everybody using Opus yet? One of the biggest issues for a new codec trying to gain widespread adoption is simply device support. A codec can be supported by every streaming service and music store out there, but if the devices that people use don’t support it, then it is all moot. The Xiph.Org Foundation ran into trouble with device support while developing Vorbis, their previous MP3 competitor. Vorbis (sometimes referred to as Ogg Vorbis with the .ogg file extension) was royalty free and showed clear advancements over MP3 in most scenarios, but it never reached the level of device support needed to see widespread adoption. Instead, Vorbis was only adopted for specific use cases by some streaming services such as Spotify, Netflix, and Youtube. Thankfully Opus has finally achieved support on all major operating systems. With the launch of macOS 10.13 High Sierra and iOS 11, Opus will officially be supported in some form by every major operating system, and every major web browser (assuming Apple doesn’t remove the support that currently exists in their beta builds). The support will admittedly still be better on some platforms than on others, but it is an important milestone in Opus’ adoption nonetheless. support as well, which Opus is expected to be commonly paired with in future WebM containers for videos. The use cases where Opus sees the largests improvements (low bitrate streaming and low latency applications like video chatting) are usually handled by programs without user input, so users may not realize that the switch is happening, however the foundation laid by those applications will enable future use of Opus for user visible use cases, like Podcasts and music downloads. With Opus’ widespread adoption, existing performance, and the continued development it is seeing, we can be assured that audio on the internet and on our devices will continue to have a strong royalty free future for years to come. Basing the internet around royalty-free and open source components is critical to a healthy internet, as it is the only way to ensure interoperability for everyone and everything on the internet. Using codecs and other software that are patent encumbered can create situations where certain users will not be able to access those parts of the internet without the website having to create multiple versions of their page, which creates extra work for the developers and causes issues for users. Free and open-source software (“free” as in “freedom” to use the software how you want) is a critical piece of our internet infrastructure, and it is great to see that when it comes to audio codecs, that freedom will continue into the future.